One of the main things I have learned over the years from my martial arts, military service, and strength & conditioning is the importance of focusing 100% on the immediate task at hand. 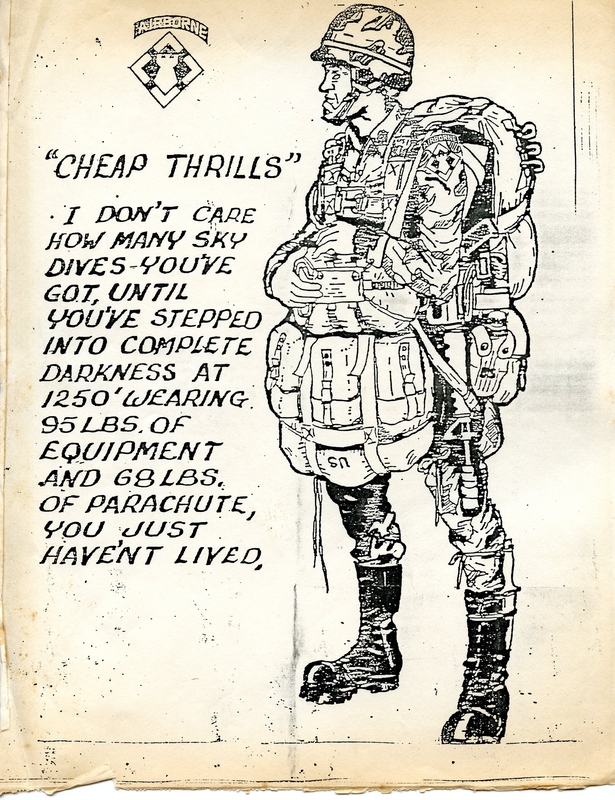 I remember many times having the door position on a night jump from a C-130; the only thing that mattered was seeing that parachute open within 4 seconds. The was my complete focus. I wasn’t thinking about what I was going to do once I hit the ground, I had to get there in one piece first. The same thing goes for lifting. You have to concentrate on that one rep, not the one you just missed or the one you hope to make next. Just this one, nothing else matters at that moment. You cannot and must not let all the chatter of this crazy world invade your thinking! Shut out the noise, the regrets, the anger, the disappointments, the busy schedule and all that other garbage and just make that one lift. click the image for other colors, sizes, etc. Safe lifting is absolutely mandatory!!!!!!!!! Yes, this does pose a legitimate threat to a person’s health and coaches/trainers need to educated on it and make sure those they train get the information on it too. Since I first affiliated with CrossFit back in 2005, We have been blessed to have never had a case of rhabdo caused by our training. Now, ten years later, my program includes Powerlifting, Strongman, and Underground Strength training. All of these are very intense types of training, but still no cases of rhabdo. Enough said on that threat. With the glut of both good and bad information available online these days some very important things pertaining to training have been overlooked. One of them is hyponatremia, which can really mess you or kill you. Living in southwest Florida, this can happen pretty easily. Being well-hydrated is important, but being over-hydrated is dangerous. Be a smart athlete so you can live well and live long! Though there are other coaches and athletes who emphasize grip strength, Jedd Johnson was the first one that got my interest in it about ten years ago. A weak grip is like no grip at all! Think of how many things in your daily life that require grip strength. Even something as basic as a good, solid hand shake (which is quickly disappearing from America) is based on grip strength. In lifting, grip strength is 100% solid gold! You must have strong hands, wrists, and forearms! Here's part of my grip training. I got the steel grip balls from Ryan Pitts and the Eagle Loops from Iron Mind. I also use sandbags for grip training, which I learned from Zach Even-Esh. There are numerous way to train grip, just pick one or two and get started! When you are a young and cocky “know-it-all” and it’s obvious that all the world’s problems could be solved if they just listened to you; you are unknowingly in for a brutal wake-up call. Many people think they have it all figured out, whether it’s life, training, dating, politics, religion, etc. and that they don’t need any help or advice to make it. One of the most valuable things you will ever find in your life is a true mentor. You are truly blessed to find even one. If you have more than one excellent mentor over the course of your life, you are incredibly blessed! I guess I am just that, since I have had numerous mentors in different areas of my life. Around 2004 I had been involved with strength and conditioning for a few years, and I was transitioning out of martial arts after a couple of decades of involvement there. Something about strength training just captured my attention, and I am not over it yet, and I probably won’t get over it in this lifetime. Now in 2015, I still am greatly influenced by about all of them. Some have moved to a more prominent position of influence on my training, while others are more in the background; but still there. I have also been blessed to have additional mentors I have found through my original ones, and they add a lot of great information. The list is fairly long, so I’ll save that for another blog post. These people have helped develop my training methods from what they have taught me. It’s been said that when you stand on the shoulders of giants you can see a lot further, and I found that to be true.